In the city center of Groningen, something has changed over the past years. If your walking past the University Library, de Grote Markt or de Vismarkt you’ll see that bicycles with blue tires are present in great numbers. Many students in the city are proud renters of the colourful bike or at least know someone who uses one. Not only Groningen is excited about this magic bicycle, almost 100.000 of them are circulating through different cities in the Netherlands right now. Yes, I’m talking about the ‘Swapfiets’. Last year the company won the prize ‘Marketing Start Up of the Year 2018, beating restaurant ‘The Avocado show’ and ‘ijssalon Koupe’. What is the marketing secret behind the winner of this prestigious contest? Let’s have a look at the background of the company and talk about their three characteristic marketing features. Swapfiets is created in 2016 by a group of students and friends in Delft. The idea behind the company is that everyone can rent a bike from the company for a fixed amount per month in exchange for an always working bicycle. In only three years, Swapfiets has grown into one of the largest bicycle companies in the Netherlands. Currently the company has over 1000 employees spread over different locations. Last year, the company even crossed the border: Belgium, Germany and even Denmark can enjoy this successful bike-as-a-service product now. So what makes Swapfiets marketing strategy so successful? The company claims that for only 15 euros a month (12 if you are a student), you’ll have an always working bicycle. That means you’ll pay around 144 euros a year for a rented bike. For that amount of money, you surely should be able to purchase a reasonable bicycle. Why are people and especially students still interested in renting one? Well, that’s because of the great service conditions of the company. Do you need a (new) Swapfiets? Delivered to you anywhere you want, whenever you want. Is your bike broken? No problem, it will be fixed for you for free within 24 hours. Swapfiets is the only Dutch bicycle provider that stores information about the end users of their product in their data system. The company indicates that this data is kept up to improve the customer experience and to improve their own business model. For example, the system keeps track of parts that break down most often. Suppose the lights of the bikes are the number one broken component of the Swapfiets. The company will then try to find a solution for this problem, so the lights will fail less quickly in the future. This makes the Swapfiets more durable and allows the customer to enjoy the product for a longer time without problems, which is good for the customer satisfaction. Last but not least another important feature of the marketing strategy: the iconic blue front tire. The company has ensured that the spotlights fall on their bikes if you are walking along a bike rack. All bicycles are from the company ‘Union’, which delivers the characteristic robust and colorful bikes that all look exactly the same. 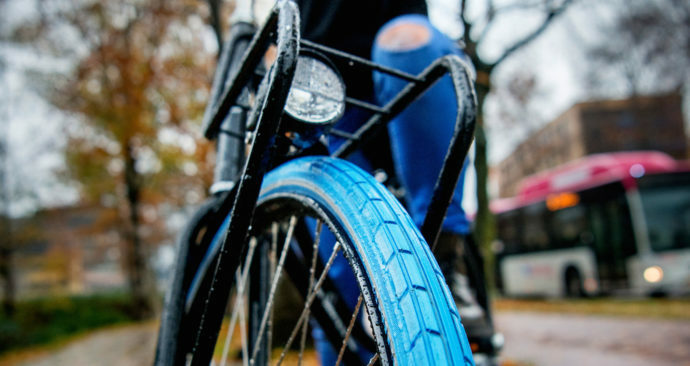 The tire is a unique feature that makes it easy to recognize the bicycles everywhere, which is a clever marketing asset. According to the chairman of the Dutch Marketing Awards 2018, everything is thought through on Swapfiets. The earning model of the company is probably a success due to the period of notice of one month. Furthermore assuming that the bicycle is less stolen than a ‘regular’ bike due to the striking appearance, Swapfiets is more profitable. That’s probably the reason the company had such a great success over the past years. At this moment Swapfiets is thinking about bringing a ‘smart’ bicycle to the market in the future that stores data about the bike by a built-in chip. Innovation plays a key role at Swapfiets and that makes the company the rightful winner of the Marketing Start Up of the Year award of 2018. TV a ‘House of Cards’ that’s going to collapse?